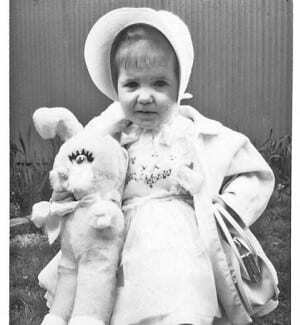 Elizabeth Gill was only 2 ½ years old when she vanished from her family’s home, in the area of the 300 block of south Larimer Street in Cape Girardeau, Missouri. The little blonde haired toddler had been playing in the front yard with a sand pail on June 13, 1965, at approximately 4PM. Decades later, the family has never given up the faith that they will find her alive.The family has long believed a group of drifters that had been staying at a hotel in the area of Elizabeth’s residence may have kidnapped her. A witness reported seeing the individuals on two different occasions try to lure Elizabeth into their vehicle. The drifters had been selling purses close to the house, and early on in the investigation considered persons of interest, but could never be located. Recently, the family hired a private detective who visited with Smith and Elizabeth’s sister, Martha Gill-Hamilton. Mike Neverett, a Florida private investigator, and Smith believe it may only be a matter of time before they solve this mystery. Neverett traveled to Missouri this April to meet with Elizabeth’s family and the detective to research the case. Taking an interesting approach, Neverett, who has been involved in the case for over seven years, recently visited the old Gill home on Lorimar Street and began taking pictures of what he describes as “pictures through the eyes of a child.” Clicking pictures of surrounding homes and the neighborhood from the height Elizabeth would have been at time of her disappearance. He hopes this may jar the memory of a woman who would now be 49 years old, and the youngest of ten children. Elizabeth’s father passed away in 1970 never knowing what happened to the youngest apple of his eye, but Elizabeth’s mother and remaining siblings have never given up hope of being reunited. Having worked alongside law enforcement for nearly two decades with many cold cases, I agree this case had all the potential elements of a solvable case. With increased national news exposure, law enforcement and private investigators working cooperatively, and especially utilizing the power of social media, there is a good potential of bringing Elizabeth home to her family. The pictures could be the key to jogging the memory of a woman who has never truly known who she is. Even I have memories of standing in my crib calling out to my mother because I had an earache. I could not have been more than a year and a half old. The mind stores everything and things decades old like a smell, a sound, and yes, even a picture can take us back. We also know in every case of a suspicious disappearance of a child or adult, someone out there knows something. We can all take a part in reuniting Elizabeth with her family by sharing her information. Let us all unite as a real social community and bring Elizabeth home! For additional information, please visit www.missingkids.com. If you have information or believe you may be Elizabeth Gill, please call Det. Jim Smith at the Cape Girardeau (MO) Police Department at 573-335-6621, ext. 1120.